So, I was maybe a little luke warm on Harley Quinn in this line. I had a slow week toy hunting, and bought a second blind can. 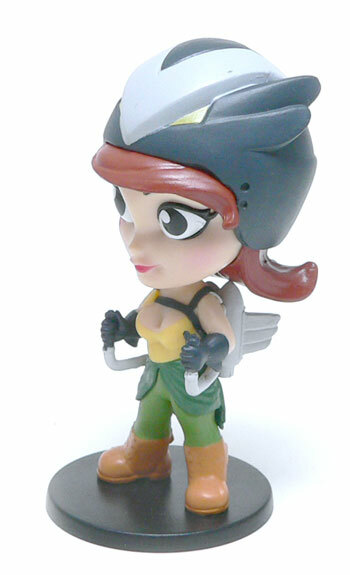 I got Hawkgirl. 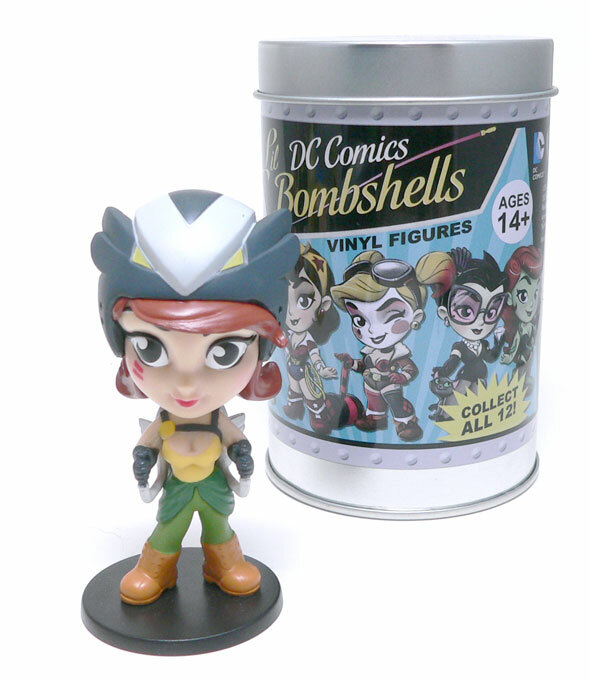 Now, I really like the Hawkgirl Bombshell statue. She’s exudes a lot of fun. To start with the scale and style match Harley. You can tell there is some cohesion in the line. That’s pretty important for something like this. You want to know if you have a bunch of them together they will look good. HG is made out to be a bit of Rocketeer type character. She has a jet pack instead of wings and a crash helmet in lieu of her normal battle mask. The overall style is a neat pulp version of the character. The sculpt is very clean. 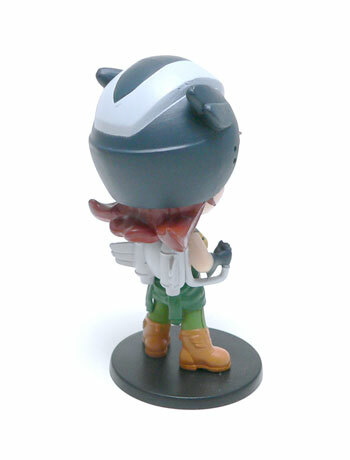 This is what you expect from a vinyl figure. smooth clean lines and a little light on detail. The paint is done well. There’s a slight bit of slop on the light grey on the helmet, but you will probably never notice it. There are two red lines on her face that perplex me. I’m sure they are related to something, but I don’t have enough history with the character to know what. One thing I like better here than Harley is the eyes. They are both open and it looks better. The jetpack surprised me as it isn’t a direct take off of the Rocketeer one. It’s go tiny wings on the side to evoke the character. It also has hand controls coming around to the front kind of like the one Sean Connery used as James Bond. Neat choice. You’ll notice I haven’t said anything bad here. There really isn’t overall the execution is pretty good. Clean paint. Clean lines. No big missteps. 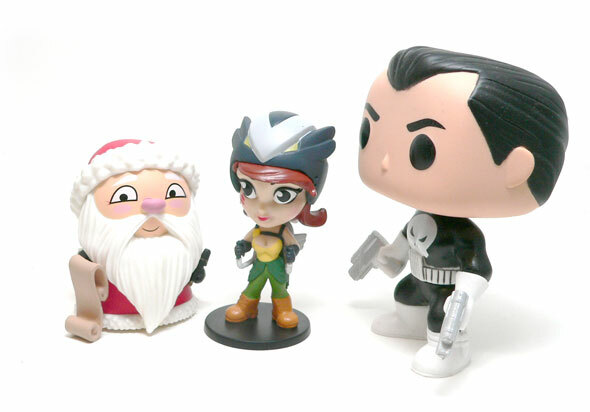 But….I can’t help to think much like Harley something is missing. I guess she’s missing the fun factor to me. It’s a very static museum type pose looking straight forward. 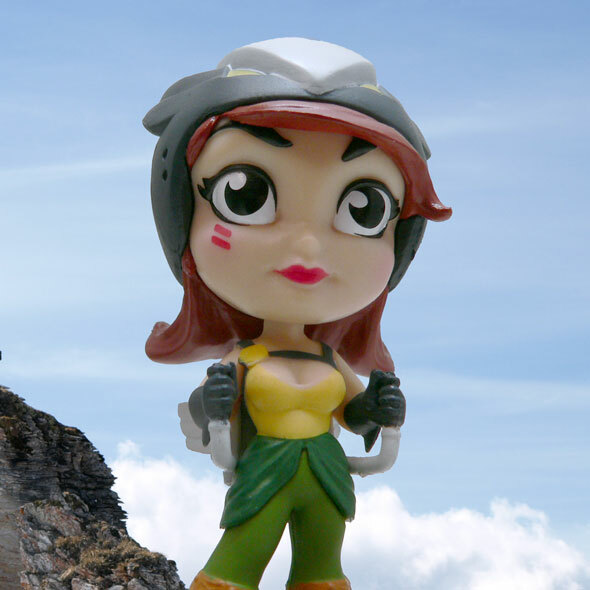 The problem with that is that if you display her looking straight on, you can’t really see her jetpack. Without seeing the jetpack, it’s really hard to tell who she is. I can’t help but draw parallels to the statue version of this character. The statue is posed slightly bent over blowing a bubble with gum. Both of those add to the charm of the statue. The pose also exposes the pack a little easier. The bubble adds a touch of whimsy. So overall, I can’t say there is anything bad here. I’m just not sold on these. I was in the store the other day and had one in my hand, but just couldn’t pull the trigger. I love the concept. I love Ant Lucia’s art. I love the statues. I only just like these. Maybe if you were displaying them near the statues, they would be cute. on their own they are just a bit on the boring side. Marvel Vs. DC On Screen Heroes Bracket - Round 2 Voting Open!